“Look candles!” He called, pointing at the colorful array in the open-air shop that was his keep. The dust, drifting as a cloud, was a ghostly spectator hanging over the crowded thoroughfare. Patrons and peasants alike moved from one shop to another. The hot midday sun was temporarily veiled by the aged oak tree standing watch, guarding the eager purveyors of art, music, and bawdy entertainment. The delicate strains of a harp were muted by the constant white-noise wash of the nearby fountain. The wind picked up, the dust moved on, and the wind chimes swirled in a frenzy of hurried notes, while the woman selling them sat calmly and added her soft voice to the harmonies. A horn sounded. The actors called out their rehearsed lines. The beaming faces of adult and child alike, harkened to the call. They chanted and stomped and clapped to the preordained rhythm anticipating the coming storm of comedic enlightenment. “It must be 1:00,” I said, glancing at my watch. And sure enough, it was. The Robin Hood and Little John epic power play was about to start again at the Sherwood stage only fifty yards away. A man stopped in front of me, staring at the shining copper roof of the Enchanted Cottage hanging to my left. I already knew what he was going to ask, as his jaw hung open and he stopped chewing on what was left of his giant roasted turkey leg. He nods and turns to his wife. He says something to her that I can’t hear. She wants it, I can tell. Should I offer to throw in the copper hook for free? Before I can finish the thought, he hands over his beer to his wife and steps forward. He shakes his head and hesitates, the usual scowl on his face proving again, that I know what he is thinking. It’s just a birdhouse… If she wants a birdhouse, I can make a birdhouse. I’ve got some tools… Yep, that’s exactly what he’s thinking. “How about $45,” he says. “No, we don’t barter on prices. But I can throw in this copper hook. It’s strong enough to hold a large hanging plant…” I say with a hopeful smile. “That would look so nice by the back garden, you know, the one we just put in last year…” His wife really wants it. With a look of disgust she hands him back his half empty beer and walks away. He follows, basking in his small victory. My husband, Randie (in the Dapper hat) and our business partner, Mike (in the kilt). Behind them you can see the Robin Hood and Little John show in progress. A few more minutes, and the laughing, energized crowd will stand and begin moving away. Maybe a few takers from there will get us a sale today. Next, the belly dancers will come out of their small hunched wagon to dance and flaunt and flirt with their translucent, Technicolor dream scarves, hoping to entice leering eyes toward the expensive fortune teller they work for. In two hours, the afternoon flood of beer, wine, and raunchy ballads will fill the atmosphere, flowing from the pub right behind us. I try to pretend I didn’t notice the big girl walking away from the shop across the sun speckled road. She is carrying a chainmail bra that she happily paid $100 for, so I can’t quite pull it off as I am wondering: Where the heck is she going to wear that in the real world? 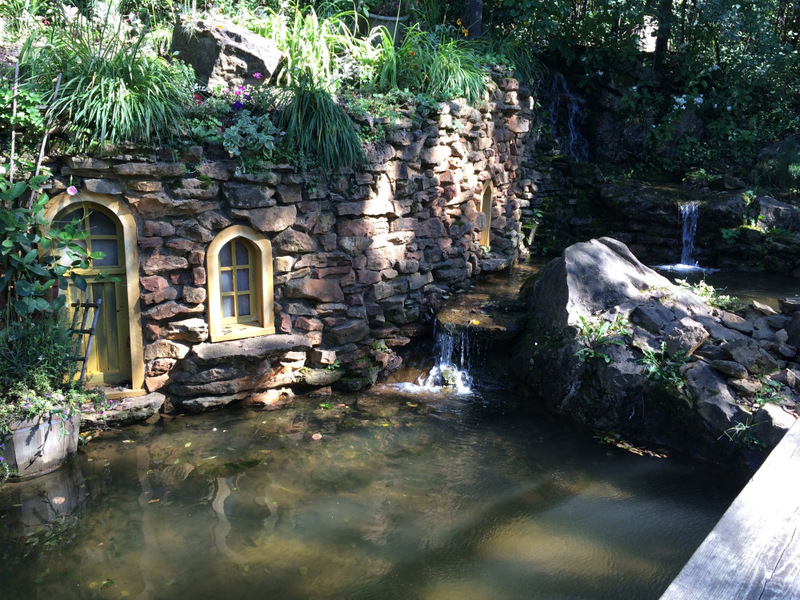 The Minnesota Renaissance Festival*, it’s a magical place. So why do I bring it up? Because that was my REAL experience. I lived it for two summers about fifteen years ago. It is the atmosphere of culture, which is so important for adding depth to your writing. I remember those details, everything my senses took in is engrained into my memory. Even the bad things, like trying to use a hot (porta-) privy while wearing a giant skirt. The too tight, lace-up bodice that made being sweaty and itchy indiscreet. The grimy dust that literally got everywhere. The sticky mud when it rained. The people, the food, the long hours, the work to make enough product, and even the hurried rush and sleepless nights to get our booth built in time. Our Booth was still a work in progress just one week before opening! The best times were the peaceful moments, even in the midst of a crowd, where I would just sit and take it all in. I didn’t know at the time that I wanted to start writing, but something about the experience filled me with a sense that I needed to remember it. I needed to take in every detail. That was fifteen years ago, and I still remember it like it was just last week. This is what you need as a writer. You need experiences, you need moments that take you back in time to what it might have been like. Sure, it’s easy to imagine and try to put yourself there, but unless you’ve lived it, the details will get missed. You are building a world that must be believed, and it’s those tiny details that will pull the reader in so close, that they will get lost there. Do whatever you have to, to find those moments. 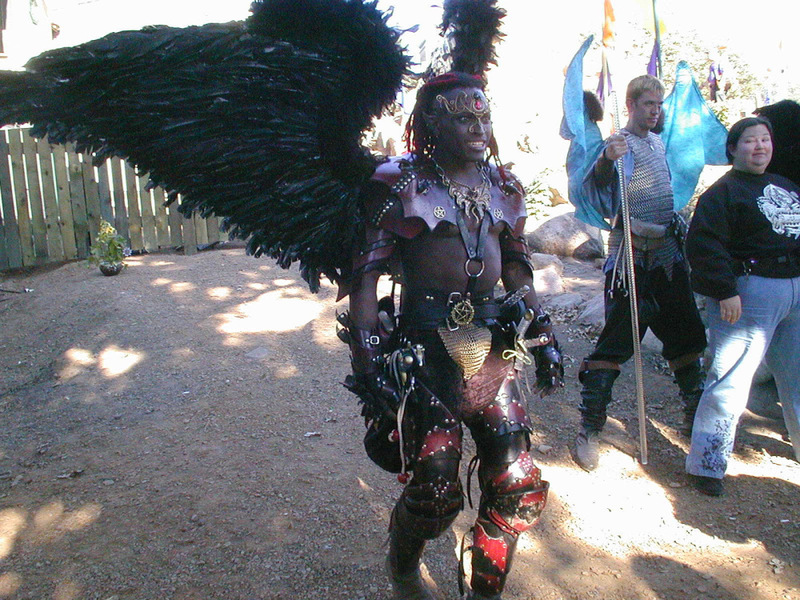 If you have a local Renaissance Festival nearby, take the time to visit it. Don’t just observe, absorb it… All of it. Sure there are people wearing sunglasses, pushing strollers, and drinking Bud Light, and there is no open sewage lying around (thank god) or the stink of unwashed peasants—though, some of the regulars who live the whole summer in camp sites moving from fair to fair do tend to have a certain… aura about them. It’s a life style and they live it, so talk to them, too. Watch the shows, watch the people watching the shows, enjoy it, get involved. The atmosphere can be quite lewd in a fun, juvenile way. You will often hear someone calling out. “Nuts for sale! Get the King’s salted nuts here! The Queen just had ‘er hands on ‘em!” or “Hey pretty lady, do you want to see my giant pickle?” Yeah… it’s that kind of humor, all day, everyday. But there is a kind of magic there that you can’t find anywhere else. Where else can I watch a real jousting tournament, where large men with long hair, in full armor actually hit each other with swords, or speed toward each other at a full gallop? Those horses are big and beautiful too. Or I could watch a Scottish Highlander show off his Border Collies and impress the crowd with their sheep herding skills. My other favorite was the Falconer. His stage was right next to the waterwheel mill called Ye Olde Scrivener, (the original Scrivener for those who know the writing software) where they made paper and taught calligraphy. The Falconer was a bearded old man that I made a point to get away and see every weekend. He would show us the amazing speed of a Falcon, a Bald Eagle would soar over the crowd, and he would warn parents to keep their small children away from the front when he brought out the Golden Eagle, a raptor that when standing on the ground, came up to my waist. These were all animals that had been rescued, and some were being rehabilitated to be sent back into the wild. Across the field, there were elephants, which at first impression you might think is inhumane, but once we talked to the trainers to learn more, it was obvious this family cared for and loved their animals. They talked in length about how smart they were, and how they do their best to make sure they don’t get tired, bored, or overheated. So I felt much better about them being there. I know, sadly, this isn’t always the case, and depending on your world, the opposite might be accurate. To see a tired, sad and lonely African elephant, to look into its eyes… You know they are looking back at you with their own kind of intelligence. If you can see it, you will feel it, and only then will you truly be able to write it. No matter what type of fantasy world you are building, you have to people it with cultures. And sometimes those people won’t get along. You may not be able to put yourself in a riot or a war (which, truly, I hope you never will) but you can still witness the atmosphere of people on high alert, the worry of an uncertain future, or the silent fear that is almost tangible in the air. Those of us old enough to remember 9/11 minute by minute, will know what this kind of atmosphere feels like. You look at everything through the lens of anger, sadness, and uncertainty. It is a hyper reality that you are suddenly in where everything you do seems to hold a different meaning. It’s like the literal atmosphere before a large thunderstorm. It just feels… different, eerie, and you can’t really relax. We were working the Renaissance the day before, and the weekend after 9/11. My husband also had another job working for the Apple Store at the Mall of America. He experienced the uncertainty and chaos of having to evacuate when no one really knew what was going on and what would be hit next. The following weekend the Renaissance was very different, almost spooky, compared to the weekend before. Less people were around, that was the most noticeable detail. No one felt comfortable in large crowds, mostly because it was a reminder of what we had all just witnessed on television. No one felt right going out and having fun, while hundreds of first responders spent days at a time sifting through dust looking for friends and colleagues. It was more a place to escape, to forget for a few hours, or just enjoy the sunshine with your kids. You could feel it, like you could everywhere, but the main difference was the shop owners, those working and having to get into character again. They were more subdued. They would stand in small groups talking about what had happened, they would visit with their neighbors a little more, and you always knew what they were talking about. They also weren’t as pushy for a sale. We were just… existing, with blank stares and quiet shock. Next time you need to write a crowd scene, a town square, the merchant quarters, or the noise upon first entering through the gates of a city, think of the atmosphere, the mood, the urgency, or the fun, go to a Renaissance Festival; it’s the closest you will ever get to actually living in your fantasy world. If you can’t get out to a ‘Ren Fest’, watch some of your favorite movies. Pay attention to the details, the sounds, the crowds. So often there are scenes where just the sounds will take me right back to my days at Ren Fest. Music drifting through an excited or playful crowd is what invokes the strongest memories, because there was always music playing somewhere. A detail that, in writing, often gets ignored. Last, but not least, is how the historical quality of a region plays a vital role. Research our own world history, how cultures shifted from one to another, how governments failed or succeeded, and what brought people together, or tore them apart. These issues will always effect the atmosphere of a people, the diversity, whether they get along, and how they REALLY feel about each other. This will bring your city to a whole new level of realism. Think history is boring and don’t want to take the time to read it? Check out this great YouTube Channel called Crash Course. (You may recognize the host, he is John Green, author of the novel Fault in Our Stars and he is funny as heck.) My son and I have been watching a few ten minute episodes every night of the World History series. My son is seven. If he’s not bored, then I promise, you won’t be either. Well, the 7 am canon just went off. They are opening the gates, and I still have to go to the bakery around the corner to get my cinnamon scone and coffee! Gotta run! Randie and I on the first day. A couple of Ren Fest Noobs! 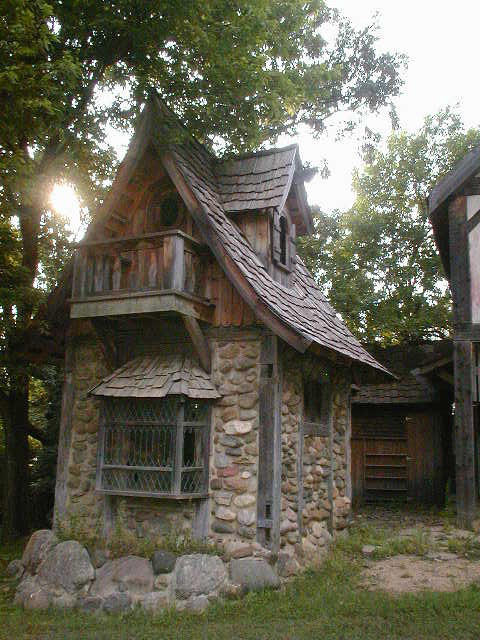 *Note: Not to end with a low tone, but the Minnesota Renaissance Festival is soon closing its doors, maybe for good. The Ren Fest has been there since the 70s, but a big corporation wants to take over and use the land for a quarry. It is right near the Minnesota River—I guess they like the gravel there. Last year, we took our son to see our booth and what it looks like now. It’s still as beautiful as ever, and they still have the copper dragon sign I made (we sold our business at the end of 2001). The parking lot is now a giant hole in the ground. You have to walk a mile around it to get to the main entrance, and supposedly this year will be the last year. They are going to bulldoze the whole place, all the buildings, the stages, the little Hobbit house and oak tree that was right next to our booth. All of it will be gone. Rumor is they are looking for new land to rebuild and reopen, but… well, that just isn’t the same. So, in a way, this article is my farewell to a place that was fun, chaotic, crazy, but always a fond and cherished memory. And… I loved our booth… it won best booth our first year. It was definitely a special, magical place.